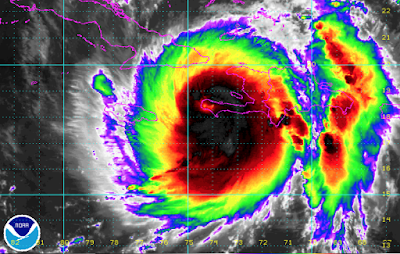 West Haiti Getting Pounded and Flooded by Matthew. Here is the latest satellite image which shows the eye of the storm inland. Note: While I'm certain the effects of this storm on Hispaniola are horrendous, this is not a "news" site, especially since it is important to convey the future effects of the storm. 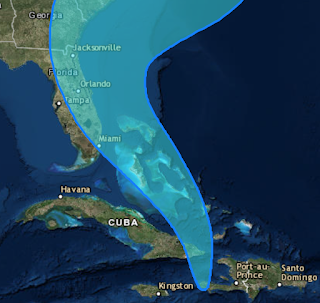 The storm will move north today clipping the far east edge of Cuba. I'm not worried abut Cuba in the sense that it has traditionally had an excellent meteorological service and I have seen pictures of boarded up windows, etc. I believe they know the storm is coming. Here is the forecast path of the center of the hurricane. I emphasize "center" because the effects of Matthew will be felt well away from the center. Please see below for preliminary, low cost, safety preparations. I'll have another update this afternoon at which time, if the situation dictates, I'll have complete safety information.